Based in Tiruverkaadu, on the outskirts of Chennai, this school is run by Udavum Karangal, a well-known organization that runs an orphanage and provides shelter to other distressed elements of society, such as destitute women and the mentally ill. It offers classes up to the 9th standard, and has been in existence now for three years. 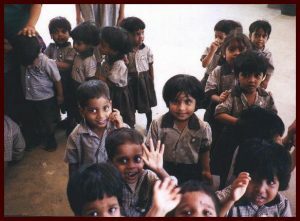 Nearly 700 of the 1000 students at this school are children of landless laborers from the villages around Tiruverkaadu. This school, Ramakrishna Vidya Niketan, has been in existence for about three years, and has plans to go up to the 10th standard next year, and up to the 12th standard eventually. It also has plans for a science lab and a computer lab. The computer lab, in particular, will be open to the residents of the nearby villages, particularly for girls from these villages who would like computer training. CVI has funded purchase of furniture for this school. CVI supported Udavum Karangal from 1999 to 2000.